Pamplin Media Group - Si se puede! Hillsboro School District's summer school program prepares 900 students for fall. For years, school districts across the country have been seeking solutions to close the achievement gap between white and non-white students. They've tried offering specialized curriculum, greater one-on-one attention, even alternative schooling options to play catch up. But Hillsboro School District has been making progress in the difficult topic in a different way, getting to the root of an issue that divides so many students and finding ways to make pursuing an education an enjoyable experience for youth of different backgrounds. Last week, the Hillsboro School District wrapped up this year's bilingual and migrant summer school, a federally-funded program the district has offered for decades. District officials say the program continues to improve each year, with greater opportunity and greater impact on students. The four-week program, which took place at Witch Hazel Elementary, South Meadows Middle School and Hillsboro High School, works with students from all walks of life, from preschool to late high school. It is both academic and fun, organizers say, giving students who might find themselves falling behind in school an engaging way to get back on track and instill confidence in their education. The program was developed to focus on Hillsboro's migrant youth, a group who make up about 7.5 percent of the district's student body. "If their parents work in agricultural-related areas ... any job that requires the family to move from district to district in search of work, that's related to agriculture, will essentially qualify a child (for migrant education services)," said Hillsboro School District's director of federal programs, Olga Acuña. Roughly one-quarter of the city of Hillsboro's population is Latino, and a good portion of that is considered migrant, a demographic makeup that has helped make the city a "melting pot" and prompted local districts to develop bilingual curriculum, dual-language schools and varying after-school multicultural programs and clubs. The summer program is offered to more than migrant children, however. Any student learning English, wherever they are from, is encouraged to participate in the summer program and can join at any time, Acuña said. "The program is hugely beneficial (for migrant students) because it allows students to go to summer school and continue their learning journey while their parents are out working," Acuña said. "It's a way to fill the gap that many of them accrue during the school year due to the mobility rate." Historically, migrant students have fallen behind in school as their families move from district to district searching for work, Acuña said, and because of added family responsibilities. The district hires recruiters who visit migrant camps during the year to inform parents and their children about the opportunities offered during the summer and regular school year to prevent students from falling behind. Recruiters also enroll kids in the Hillsboro School District on the spot, Acuña said. An evening summer program is also available to older migrant students who may work agriculture-related jobs with their parents during the day but still want to focus on their education in the evening, Acuña said. More than 900 students from across Hillsboro participated in this summer's program. The students focused on reading and math skills, while improving their written and oral communication in both their native language and English. Students participated in classes much like the regular school year, but coordinators worked hard to make the five weeks as engaging as possible for the kids, Acuña said, to give them a desire to come back each day and work hard. "We embed language and math into a culture that also allows the students to engage in a socially and emotional way," Acuña said. "It's like summer camp, but also academic." The students participate in many of the same classes they would during the regular school year, Acuña said, including music, physical education and library. They play games and even take weekly field trips, she said. This year, groups visited OMSI, local museums, Hillsboro's Concerts at the Park, and the Hillsboro Hops baseball stadium, and some of the older students got to see a movie in the theater for the first time, among other activities. One important aspect of the program is making the kids feel comfortable and at home in school, Acuña said. Pursuing a traditional education doesn't mean they have to leave their family traditions at the door, she said. "Every summer we bring in teachers from Mexico who bring in culture and music and tradition and it is one way to help our students maintain their cultural background," Acuña said. "And so we provide them with enriching activities that they engage in, like dancing and learning about Mexican culture, the Spanish language and traditions. A lot of the students will relate to those teachers because of their siblings or their parents, or because of stories they've heard from their parents, so it's a way to maintain their cultural life." It isn't only the students who benefit from services offered in the program, Acuña said. Families get something out of it, too. For the first time, this summer's coordinators were able to hire a slew of support team members, including a wellness counselor focusing on trauma-informed care, a family and community engagement liaison, and a liaison who works specifically with families who have home instabilities or are homeless, who need assistance in finding support and shelter. On top of that, some partners of the district provided the kids with medical care they may not otherwise have the means to access. Pacific University's optometry van was parked outside, providing vision services to kids, including screenings and free glasses to those who need them, Acuña said. The kids also had access to free dental checkups from several different providers and care from Portland State University's Speech and Hearing Sciences Department. "It's amazing," Acuña said. "The level of work that our student support team does to reach out and access services for our students and their families has been a positive addition to summer school." Hillsboro's summer school program isn't like most others. It doesn't focus solely on students who have fallen behind, taking away time most other students are relaxing and getting a break from school. "It is an opportunity for students to not only spend quality time with other students who share a similar cultural background, but it also helps students catch up in their academics and in their learning," Acuña said. "It boosts their self-esteem so when they begin school in the fall, they feel better prepared to tackle the new school year." The program gives students who are statistically more likely to fall behind, Acuña said, an opportunity to stay on track in a fun way, with kids and teachers they can identify with. "Students come to the program because they want to be there, they want to come," Acuña said. "They find a special place there with special people that are fully dedicated to their social and emotional wellbeing and who support their academic advancement." 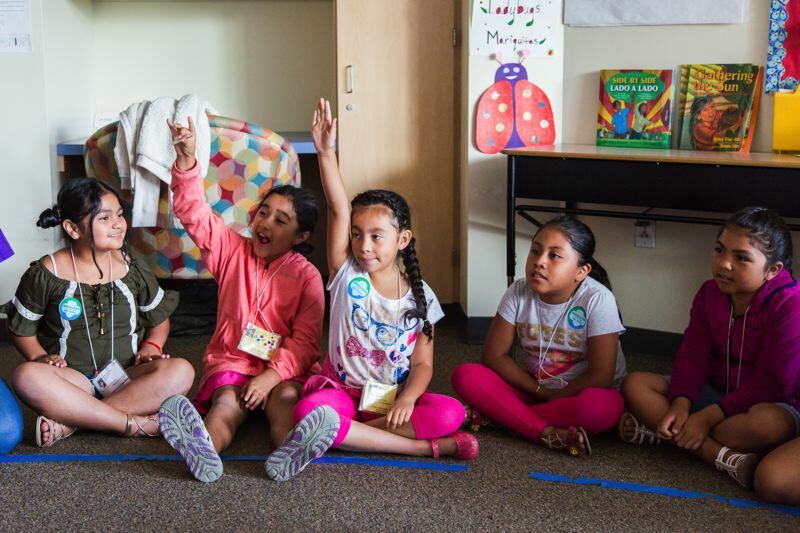 One of the programs offered at this year's summer school program was the Girl Scouts of Oregon and Southwest Washington summer program, "Puentes," or "Bridges." The program was formed to introduce Girl Scouting to Latina girls, a group that hasn't historically been very involved with Girl Scouts, said Latina Program Manager Celia Alvarez. "(The program teaches girls) to develop their sense of self, connection with others, team building, learn about opportunities to advocate for the community," Alvarez said. The girls worked to earn a Dolores Huerta patch, a Mexican-American civil rights activist who co-founded the National Farmworkers Association, or what is now called United Farm Workers, who was a Girl Scout herself, and learned about other accomplished females like Sally Ride, Michelle Obama and Venus Williams, who were Girl Scouts. The Puentes program was available to girls in kindergarten through the fifth grade and they developed leadership and life skills, learned about healthy living, participated in STEM projects, played traditional Girl Scout games and participated in team-building activities, administrators said. They also learned the Girl Scout Promise song in both English and Spanish. The group also learned elements of the law and were visited by a female Hillsboro Police officer. While the short program served as merely an introduction to what Girl Scouts has to offer, Alvarez said they hope to develop bilingual troops in the future, getting both Latina girls and their parents involved in the program.